I’ve created this page for new puppy owners. As you are anxiously waiting for your new puppy, you might as well go shopping and get those needed items before puppy gets home! These are not all necessary items but will give you ideas on things you may want to get. You will probably want some type of bed for your puppy. 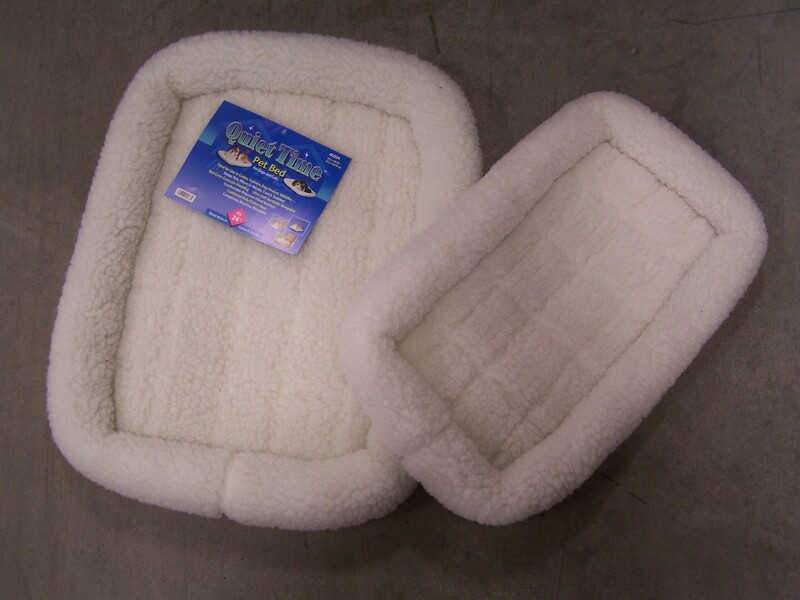 I really like these sheepskin looking ones as they come in different sizes, are washable, fit in crates and are fairly inexpensive. Buy two, so you have an extra while the other is being laundered. I also love these fleecy blankets I get at our local WalMart for around $3. They come in a variety of colors and patterns, wash us nicely and the dogs love to dig around in them to make their “perfect” bed. I highly recommend a crate for your new pup. They’re great for potty training, travel or just nap time! Crates can be found in either these plastic types or wire varieties. I use both at my house. For most of our average sized Cavapoo you will probably want to purchase a medium sized one. This is a Doskocil Pet Mate medium sized that I pick up at WalMart for about $45. It measures 24L x 21W x 22H. If your puppy is estimated to mature in the smaller range 10-14 lbs. you can go a step down in crate size. I also use these wire crates a lot. They are a bit smaller than the medium plastic crate shown above. This one measures 24L x 17W x 20H. They are lightweight and also fold down fairly flat when not in use. You can check online for sales and get one for about $20. You will need some kind of containment are for your puppy. I recommend the Iris Dog Pen. These come in 2 sizes. Get the taller one. If you get the shorter one, trust me you’ll regret it. Cavapoos are smart and athletic and can easily clear a shorter pen in no time! You can find these on Amazon. (See our example below for a containment area). I can’t stress enough how important a containment area is for your new puppy…a nice, safe confined area when you are not able to have the puppy right with you under your supervision or you have to be at work, school, shopping etc. It is a small area, but that way the puppy doesn’t have a lot of options when it comes to relieving itself. As a puppy gets older and more trustworthy, the area can be enlarged. A lot of people start out giving their puppy way too much freedom and the puppy learns to potty everywhere, then end up wondering why they can’t get the puppy potty trained. Even if you are training your puppy to potty outside this is a nice set up if you’re away during the day. Then resume your outside training when you’re home! Below are a couple videos of the taller Iris pen using six panels. I have this set up in the dining area for training puppies. And as you can see our newest Poodle puppy is not happy being contained, but she’s learning about it fairly quickly. I too, go through the same thing you will go through with your new puppy! This shows the taller of the Iris pens (6 panels). This gives more room for a puppy who has been consistently using their litter box. Plus there is still room for a crate, food and water and toys. A perfectly safe place for the puppy to be when you are busy or away at work. It also shows the type of litter box that your puppy has been using. Just a simple plastic container with a layer of wood pellets on the bottom. The wood pellets are wood pellets that are burned in a pellet stove. They are just pine sawdust with wax so there is nothing harmful in them. I buy them at our local feed/farm supply store for about $4.50 for a 40 lb bag. You can sometimes also find them at places like Home Depot, Wal-Mart, etc. But if you don’t have a farm/feed store nearby, you can pick up something similar at a pet store. (You just pay more money). These pellets are very similar to what we use. Please don’t be tempted to buy the paper pellets as your puppy might be tempted to eat them. Also, the clay cat litter could be dangerous is ingested so avoid that too. Your puppy has been raised on Fromm’s Classic Puppy Food (not grain-free) I would keep your puppy on it for the first year and then gradually switch to the adult food. It’s a quality food at an affordable price. This food is found at dog specialty stores so you can go on Fromm’s website to find a store near you. Or if you’re like me and a couple hours away from a dealer, I order mine online from petflow.com and have it delivered to my door. 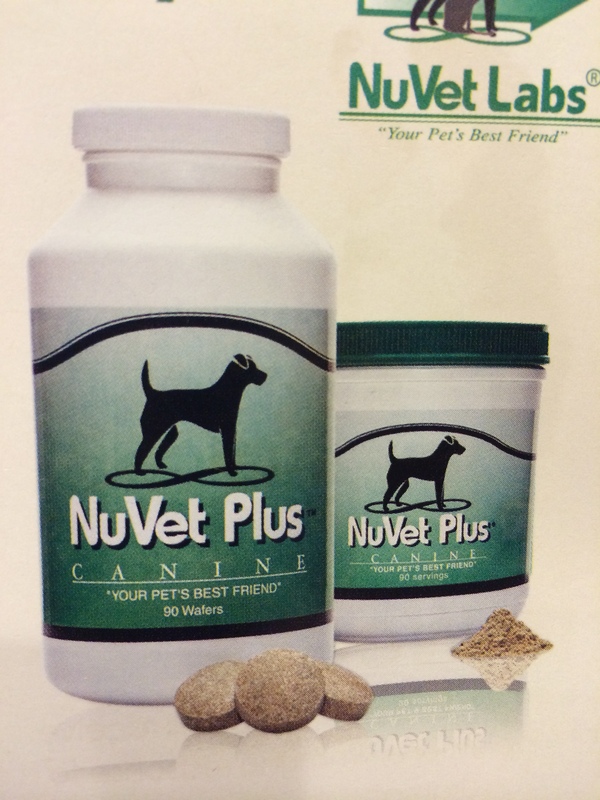 And speaking of edibles; I highly recommend the supplement NuVet for your puppy (and any adult dogs you might already have). It’s not only a vitamin supplement but an immune system support for that growing, maturing puppy! Please see our “NuVet” page for more information. I’ve even considered making NuVet supplementation part of my puppy guarantee. I think it’s that important. Please give it a try, at least for the first year of your puppy’s life. 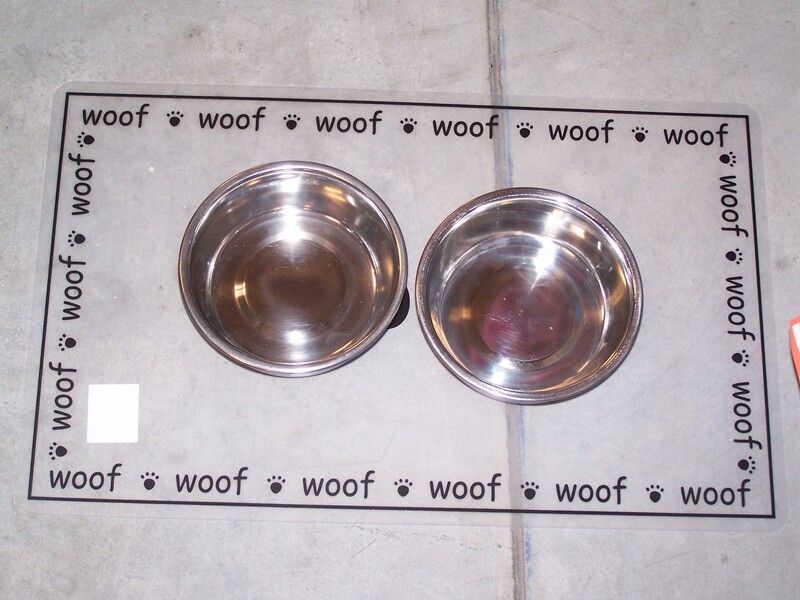 Don’t forget food and water dishes for your new puppy. I recommend either stainless steel like these or the ceramic/crock material. The stainless is easy to clean, and the crock style is a bit heavier for those rambunctious puppies that tend to knock things over. Very helpful info. Thanks for sharing.